It is a strongly aromatic shrub. The leaves are evergreen, 2–6 centimetres (0.79–2.4 in) long, and 4–6 millimetres (0.16–0.24 in) broad. The flowers are pinkish-purple (lavender-coloured), produced on spikes 2–8 cm (0.79–3.1 in) long at the top of slender, leafless stems 10–30 cm (3.9–12 in) long. The species name angustifolia is Latin for "narrow leaf". 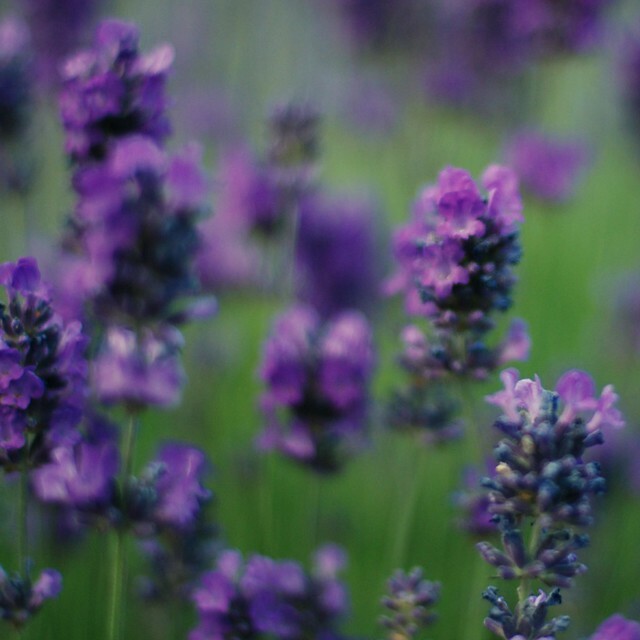 The genus name Lavandula simply means lavender. Previously, it was known as Lavandula officinalis, Latin for "official lavender" or "true lavender", which is one of its common names. This indicated it was the official medicinal lavender. English lavender is commonly grown as an ornamental plant. It is popular for its colourful flowers, its fragrance and its ability to survive with low water consumption. It does not grow well in continuously damp soil. It is fairly tolerant of low temperatures, generally considered hardy to USDA zone 5. Lavender essential oil, when diluted with a carrier oil, is commonly used as a relaxant with massage therapy. Products for home use, such as lotions, eye pillows (including lavender flowers or the essential oil itself) and bath oils, etc., are also used to induce relaxation. Both the petals and the oil are the most popular ingredients in handmade soap.